Historically, videogames never make the transition to film smoothly, and vice versa. 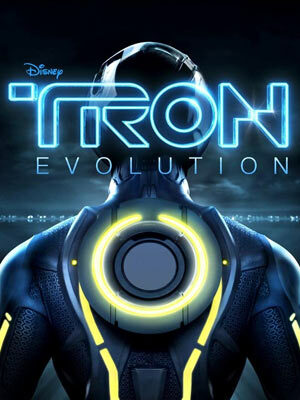 Would Tron: Evolution--essentially a videogame based on a film based on videogames--fare any better? We had hoped it would, but unfortunately, the game still feels very much like a bland, movie tie-in that never really inspires nor impresses. Which is truly a dissapointment, because the Tron franchise, or at least the first film in 1982 and the new Tron: Legacy film, offers a really intriguing universe that should have translated well in the language of games. Tron: Evolution attempts to excite the way that Prince of Persia stunned you with its acrobatics and all that wall running, and the way that Assassin's Creed made you hold your breath after a glorious leap of faith, that's sometimes fatal. Gone are the sandy vistas, and the brown-dominated color palettes. In its place: blue neon lights and levels and architecture straight out of The Matrix. It sounds pretty exciting. And in fact, it is. But the dazzle in those sweet moves only lasts for so long. You'll notice quickly that you're doing all the same things, and that's where the game starts to fail. Whereas the other games we compared it to allowed a certain sense of freedom, and goals that really kept you playing, Tron: Evolution is a lot more akin to connect-the-dots. From point A go to point B. Rinse and repeat. Combat is hardly something that'll keep you going as well. There are melee attacks and light disc throws which you can chain into a couple of combos, but ultimately, it becomes apparent that there's no real strategy needed to win the battles. Thus, the fighting becomes predictable, and never something that will require more than the usual button mashing you've long mastered. It usually just becomes a test of how fast you can press the buttons. It certainly doesn't help that the characters in the game feel dull. The graphics used on the character models would have impressed, if it had been the year 2006 and we haven't been exposed to the likes of Xbox 360's Gears of War 2, and the PS3's Uncharted series. As it stands, the game just feels bland. That the animations are robotic doesn't help its cause as well. There are a few moments in the game that really make us sad about the game's wasted potential. Case in point: the light cycle pseudo-racing sequences. Racing through the game's neon environments and futuristic aesthetics on an equally futuristic crotch rocket no doubt stirs our loins. But Tron: Evolution's true saving grace is multiplayer. In multiplayer, you play deathmatch style Grid Games, and battle other people on the aforementioned light cycles. If you thought it was cool to race using the sinful racer, well, try ramming other riders with it. It's like Twisted Metal, but a lot faster. Remember you're not riding on no psychotic clown van here or an armed muscle-car (although that was pretty cool too) here, you're riding the future of motorbikes. So maybe there's hope for Tron games. Only it probably exists somewhere deeper into the future. Tron Evolution is available for the PS3, Xbox 360 and the PC. 7 Ways to Bling Up your Gadgets!